Should I go with the green sashing and yellow star cornerstones? I kind of thought it would look good to repeat the stars from the corner block in the sashing.Now It looks too busy to me with my blocks. What about green sashing with the wrong side of the yellow cornerstones without the stars? Should I use something else entirely for the sashing? I need help! If my monitor is true, that sashing seems to really blend in with the colors of the quilt. It gives a very subtle look to the quilt. I would probably look for a sashing with more contrast. Actually, I have an opposite opinion, as your quilt top has some really nice blocks, which I'd want to be the focal point. I'd probably just do a simple sashing in the same background color as the blocks have, just to separate each one, and bind with the same fabric. Your blocks are lovely and should be the main focus. I tend to like blocks done in two sizes. i'd think putting stars in the sashing would work well. and it all would have a soft look. Well done. It wouldn't be hard to find fabric to sash it with the cream. This is a close-up of a couple of blocks with how I wanted to do the sashing. I will have to leave it up for a while and look at. That doesn't count as a UFO right? Beautiful blocks, and I agree that they should be the focus, rather than the sashing. Have you considered setting them on point? I think that (almost) always makes a quilt even more spectacular. Since the quilt is scrappy, you might also make the sashing scrappy, using primarily the lighter fabrics with a darker one here and there. I agree with DebbE. I would use your background fabric for the sashing. 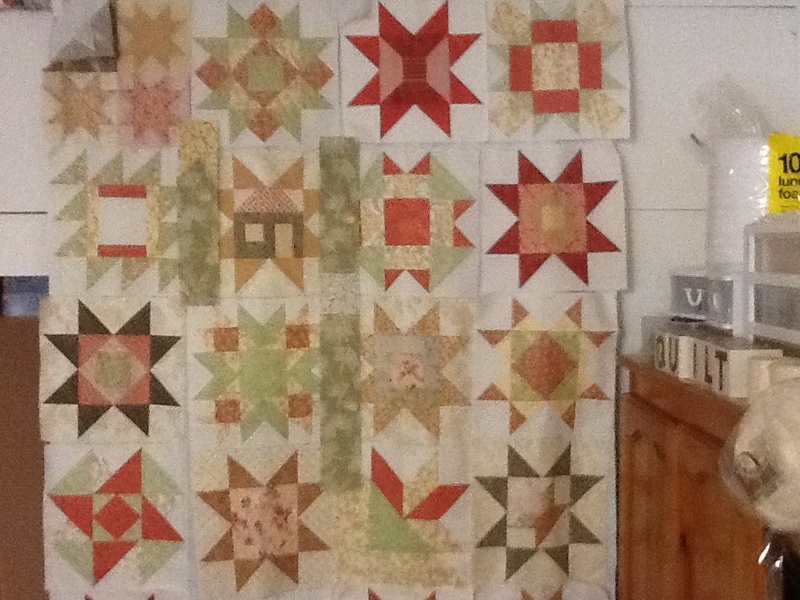 You want your beautifully pieced blocks to be the star of this quilt. You did a very great job with your color selection. Good Luck !!! Then go with the background fabric for the sashing. You could do some really nice quilting in the ashing area, which would really let those stars shine forth! And too, I like Dunster's on-point suggestion. I'll take it a step further beyond sashing ... and do alternating blocks of the background fabric ..... and would even audition the alternate blocks in the pale green. 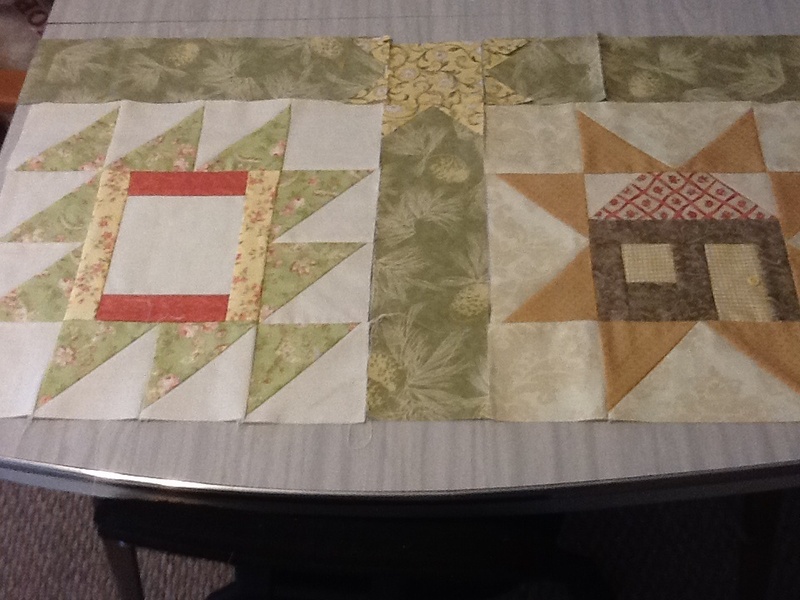 Again, some pretty quilting will go nicely into those alternating blocks and still let the stars shine nice and bright! Hate to put another spoke in the wheel here, but I think the sashing might actually help to set the blocks off by making them all stand apart from one another, like a collage frame sets off each individual photograph. And since it appears you haven't used the same background fabric for all your blocks, it would be hard to sash them all with the same fabric. I do like the green sashing you've chosen. And the stars in the corners are low enough contrast that they're not going to draw a lot of attention to themselves, but add another layer of detail. You MIGHT consider framing each block with strips of its own background fabric, so they would then float away from the sashing, if that makes sense? Just another opinion. And no it's NOT a UFO, it's just "simmering". It becomes a UFO when you pack the blocks all away in a bin in the closet where you can't see them. I have a quilt hanging over the rail on the 2nd story landing of our house right now because I have to study it for a few days (weeks) before I decide how I want to quilt it. It's the only place big enough I can see the whole thing! I think your blocks are beautiful but I just don't care for the green sashing. I think the blocks should be the focus as several other board members have said. I think it will be a great quilt when finished. I find the sashing a detractor from the beautiful stars and busy. Have you considered a more narrower sashing? This may frame the stars yet maintain the focal point on the stars. Beautiful blocks! The on point suggestion has me interested! I think a colored sashing will help set the blocks off better but I don't think it should be a print. A solid would work but I'm really leaning towards a blender . . . I'm with the "sash with the background fabric" crowd, and I like the on point idea too. However, I think your idea for the stars as cornerstones is really really cool. What about background fabric for the sashing...but with the cool little star corner stones? I agree with the background sashing, sure is a beautiful top!!!!! It's a lovely top. I like Alison's idea - that or a narrower sashing. Good luck deciding! Would love to see a photo how it all turns out. I agree with cream sashing to set off your beautiful blocks. I really like the idea of a light colored sashing similar to the background - since your background is not the same in all the blocks. The little stars would look like they are floating if you used a very light sashing. The green sashing you have would not allow the little stars to shine. I'd like the darkest green for the sashing with lighter green corner stones. I really like what you have done in the second photo. Lisa, I have to agree with you. I think a contrasting sashing would show off the blocks more unless she wants a more subdued look. I agree with DebbE i think the blocks are just lovely and need to be the focal point, using a sashing like the background fab. would really make your blocks the main focus. A diff. colored sashing may take away from the blocks. Just my opinion. I would try something with more contrast like the reds or the brown. Would give it more depth. The lighter colors blend as if there's no variation. it's a great quilt with great colors. I would just go a little bolder and deeper/brighter. Anxious to see when it's finished.